press release 2018.09.19 - ZYLIA PORTABLE RECORDING STUDIO. MULTI-TRACK MUSIC RECORDING WITH ONE MIC. 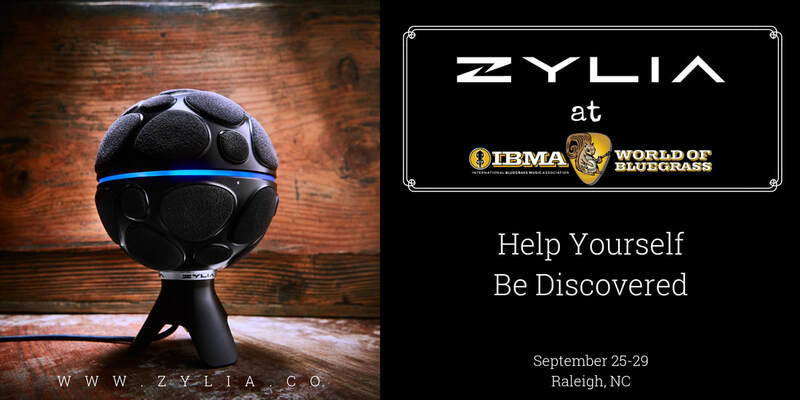 Zylia, the Poland-based manufacturer of audio recording technologies, will host a pop-up recording studio at World of Bluegrass, Sept. 25-29 at the Raleigh Convention Center in Raleigh, North Carolina. When musicians at the show bring their bandmates and instruments to the unique Zylia studio, they can record with the remarkable new ZYLIA ZM-1, an innovative new device for single-mic recording and sound-source separation. Tomasz Żernicki, co-founder and chief technology officer of Zylia, will lead an IBMA World of Bluegrass conference seminar titled, “Audio Recording Techniques for Acoustic Musicians.” He will reveal secrets of audio recording that will help bluegrass musicians fully capture their passion and creativity, discussing topics including different types of recording microphones and their usage, various recording techniques, necessary equipment, the acoustics of rehearsal spaces, and innovative technologies available to musicians today. In exploring these options and tools, he will show attendees how to preserve moments of chemistry between musicians and record a great-sounding demo. During the show, Zylia experts also will offer daily workshops on new 360 audio recording techniques with the ZYLIA ZM-1. This incredibly light, compact, and beautifully designed recording solution is capable of delivering 48 kilohertz/24 bit resolution while capturing the full spatial sound scene. It can record a 360-degree multisource sound scene and automatically separate individual audio tracks afterward. Musicians simply connect the ZYLIA ZM-1 to a laptop via USB, and they are ready to go. World of Bluegrass attendees interested in trying the ZYLIA ZM-1 for themselves can book a 20-minute recording studio slot at www.zylia.co/worldofbluegrass.html. World of Bluegrass events bring both professionals and fans together to connect, discover, and grow in bluegrass music. During the event, Zylia experts will be on hand at the company’s booth to discuss applications for the ZM-1 and other technologies, including the ZYLIA Studio PRO VST/AU plug-in and the ZYLIA Ambisonics Converter. More information about World of Bluegrass is available at https://worldofbluegrass.org/.